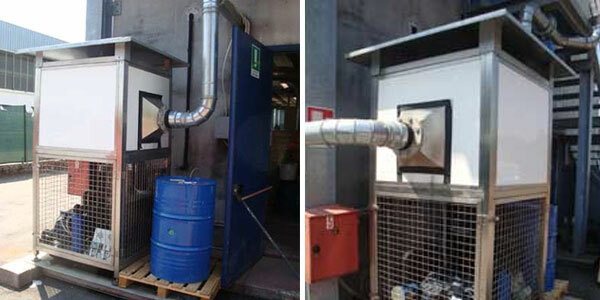 The system, called “CRYOCLEAN COMPACT”, allows to treat all the polluted air coming, either from the production site, either from a wash machine: the process happen in closed air circuit. 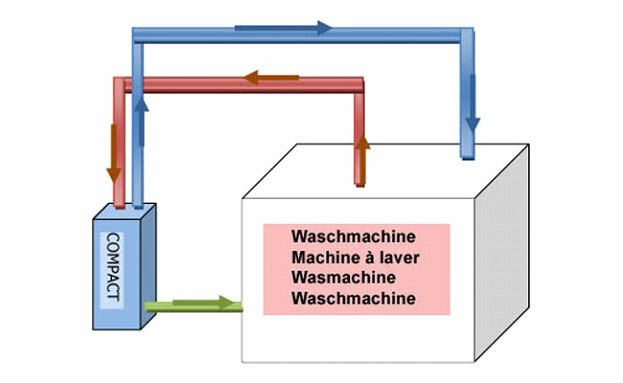 By modifying rather abruptly the temperature while preserving an equal charge, it causes a condensation of part of the solvent which will be then recovered and given at disposal of the production or sent back inside the wash machine, all this occurring in closed circuit. No emission anymore in the air and a complete recovery of solvent during the drying cycle. Again a place in the production where many economies are to be realized. Washings of parts represent a very important cost in the production. A really attractive investment, as we know that, during every drying cycle of a wash machine, +- 25 liter of solvent are thrown in the air or are burned. It seems not much, but when we tell on 10 cyclus a day, on 220 days, we are speaking about … 55.000 liter of solvent !! That means …about 55.000 to 60.000€/year lost. We are recovering all the solvent thrown out. If the solvent was originally burned, this system makes it sometimes possible to decrease the dimensioning of the burner.